As global citizens, we urge you to enforce the $5 billion fine against Shell to compensate the people affected by the 2011 Bonga oil spill. We call on you to end oil impunity by endorsing the NOSDRA Amendment Bill that holds polluters accountable with clear penalties, and support a Petroleum Industry Bill with strong transparency, accountability and environmental provisions to reform Nigeria’s oil sector. 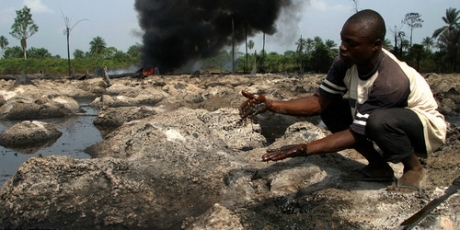 In days, Nigeria's Parliament could approve a $5 billion fine against giant oil polluter Shell for a spill that devastated the lives of millions of people, and pass a law to hold all oil companies to account for polluting and plundering. This is a watershed moment, but unless we all speak out, oil giants will crush it. Finally, Big Oil is having to pay for the wasteland and violence that they’ve created. President Jonathan supports the Shell fine, and progressive Senators are pushing for strong regulations, but oil companies are slick, and without huge international support MPs could buckle under the pressure. Politicians are deciding their positions right now -- sign the urgent petition for the Nigerian Parliament to fine Shell and support the bill, and then forward this page to everyone -- when we hit a million signers we'll bring our unprecedented global call to the steps of Nigeria's Parliament.